I finished a quilt for a friend, first one I’ve made with an actual binding. A couple months ago he was going through some especially difficult times, including moving into his own apartment during a difficult break-up. I made a small lap quilt for the couch in his new living room. It was put together six weeks ago except for the binding, and then I set it aside during the Organizing Challenge. I haven’t given it to him yet. If you’re seeing this, I hope you like it! I’ll deliver it next week. In real life the greens are more turquoise-y. I’m having trouble resizing the pictures, so will wait to post more when they’re not 1.4 MB each. I’m going out of town until next Wednesday, and I’ll be without an online connection. I haven’t gone that long without the intertubez since, I don’t know, 1998? How did people live like that???? March 26, 2010. 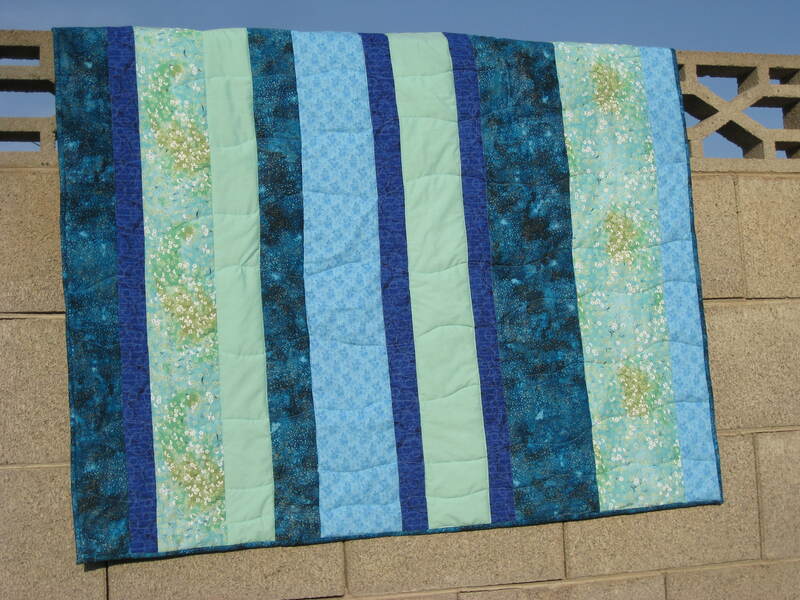 Tags: blue & green, completed project, quilt. Pictures, Projects, Words. Noting your many, many designs, I think the mathematical challenges of choice/art are partially attracting you to quilting. Yes? I love that stripe arrangement of narrow/wide and the colors. March 27, 2010 at 6:51 am. Permalink. I like how you chose to make the strips in different widths; it adds interest. March 27, 2010 at 7:50 am. Permalink. I like all the different blues. It’s interesting without being overwhelming. I am pretty sure I’d start gnawing the furniture if I had to go for more than a couple days without Internet access. I know this about myself, and also dislike it. Oh, Internet, you are such a blessing and a curse! March 28, 2010 at 8:43 pm. Permalink. I love the fabric pieces you chose! April 1, 2010 at 6:01 am. Permalink. I love the stripes! And the different blues are lovely. I’ve never made a quilt before. Is it hard?? April 24, 2010 at 10:46 pm. Permalink.